Thank you for your letter of March 28 and for the opportunity I had to meet with you on that same date to discuss the Minnesota Regional Poison Center's 24 hour Right to Know/Hazard Communication (RTK/HC) telephone hotline. We apologize for the delay in this response. The purpose of your letter was to clarify the intent of your program as regards the use, availability and support of on-site MSDS information. You also asked the Occupational Safety and Health Administration (OSHA) to provide you with a written response as to whether or not your program approach conflicts with existing OSHA rules and regulations regarding use and access to MSDS information for both stationary and mobile workforces. This letter is a response to that request. with the MSDS Hazard Communication Mobile Desktop from Safety Emporium. In your letter, you differentiate between how MSDS will be maintained on site for stationary and mobile workforces, however, you do not specify the source of these MSDS. You state that "onsite copies of MSDS" will be "available and accessible within each workshift" for stationary workplaces while for mobile workforces, "hardcopy MSDS information" will be maintained at the primary or central work location. We would like to clarify the requirements for onsite MSDS sheets. 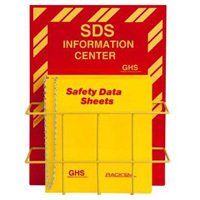 Paragraph (g)(9) of the Hazard Communication Standard (HCS) requires that the material safety data sheet, not just "MSDS information" be kept at the work location. This requirement includes mobile workforces where the standard permits the MSDS to be kept at the primary workplace as long as all of the required information contained on the MSDS can be immediately obtained by employees in an emergency. The standard allows the MSDS to, as you indicate per paragraph (g)(10), "be kept in any form, including operating procedures," however, this provision applies to alternatives to MSDS located within a plant site (see Federal Register, vol. 48, No. 228, pg. 53337). This alternative approach was intended to allow employers to address the hazards of a process, rather than individual chemicals, again, within or while on a plant site. Substitutes for MSDS must provide all of the required information from the original MSDS in hardcopy format. The MSDS must be specific to each chemical manufacturer's product and, each MSDS must contain the specific chemical identity as used on the required label on the chemical. Further, each chemical manufacturer or importer must list on the chemical's MSDS their name, address and telephone number or the same information for a responsible party" who will provide additional information on the hazardous chemical and appropriate emergency procedures (see (g)(2)(xii)). Thus, the MSDS information must provide the specific telephone number or other emergency contact information of the chemical manufacturer for the specific chemical that they are working with, as required at (g)(2)(xii) of the standard. As you are aware, it is the responsibility of the chemical manufacturer or importer to evaluate and compile all the hazard information known about the chemicals he produces. It is also his responsibility to transmit and update that information on MSDS sent to downstream users. Any party who changes a chemical's MSDS or label then becomes the responsible party for the change. Responsible parties must be able to supply all the information required by the MSDS, including appropriate emergency information as discussed above. It has been estimated that there are about 650,000 hazardous chemical products utilized in American workplaces, and hundreds more are introduced into the workplace annually. Chemical manufacturers and importers are the ones who perform the hazard evaluations on the chemicals; they generate or keep the data; and they are the ones who know about their products. Therefore they are in the best position to provide and keep up-to-date the hazard information data required under the HCS. MSDS for "identical" chemicals produced by different chemical manufacturers may contain different information, depending upon when the MSDS was most recently updated with new information, when it was sent to and received by the using or downstream or reported contaminants which may affect the hazardous properties of the specific chemical. Therefore, if the supplemental information provided by the RTK/HC hotline is the information from or reported on each chemical manufacturer's or importer's specific MSDS, then the hotline service would serve to increase the effectiveness of the employee's overall hazard communication program. But, again, the information provided must be from the chemical's own MSDS, not a compilation of data from secondary sources, which may not be representative of the manufacturer's hazard determination to that specific chemical. We hope this discussion has been helpful to you in understanding the requirements of the Agency regarding the information provisions of the HCS. Please feel free to contact us again if we can be of further assistance. During the last six years the Minnesota Regional Poison Center has implemented Right-to-Know/Hazard communication programs for numerous governmental and corporate clients. The focal point of our program has been a 24 hour Right-To-Know/Hazard Communication (RTK/HC) telephone hotline answered by knowledgeable health professionals regarding all aspects of safety information from general MSDS clarification to emergency response or exposure advice and triage. During this last year we have been attempting to expand our program to the telecommunications industry for their stationary and mobile workforce. Discussions are currently underway with the Bell South, Contel and U.S. Sprint organizations. In June of 1989 we met with members of the MSDS information. You also asked the Federal Office of OSHA in Washington D.C. to present information on our program and its application to the Hazard Communication Standard Subsequent to that meeting we received written correspondence from Patricia Clark suggesting that aspects of our program were not acceptable, specifically in regards to the role of the hotline and MSDS availability in the workplace. It is apparent that the "perceived" intent of our program was to replace the current use of on-site hardcopy MSDS information with the hotline. The purpose of this correspondence is to restate and clarify the intent of our program as regards the use, availability and support of on-site MSDS safety information. MOBILE WORKFORCE - Workers traveling between multiple worksites are provided with a tollfree 1-800 telephone number to the Poison Center where a central bank of MSDS information is maintained. Verbal MSDS information as well as FAX transmission of hard copy MSDS information is available at all times pursuant to the Hazard Communication Standard (per 1910.1200 (g)(9)). Additionally, hardcopy MSDS information is maintained at the primary or central work location as required in the""Hazard Communication Standard (per 1910.1200 (g)(10)). As stated in the standard it is our understanding that "Material safety data sheets may by kept in any form, including operating procedures", as long as the necessary information is available to the employee. STATIONARY WORKFORCE - Workers will have access to on-site copies of MSDS's available and accessible within each workshift (per 1910.1200 (g)(8)). A 24hr RTK/HC hotline to the poison center, where a masterfile of MSDS information is maintained, will also he available to the employee. This hotline will serve to supplement and update, if necessary, the on-site information and offer an immediate response for verbal clarification of MSDS or other safety data as well as FAX or computer generated transmission of pertinent information as requested by the employee. This includes the communication, transmission or mailing of safety data to the employees home or outside the workplace at the employees' request. Working at a remote location? Portable eye wash units from Safety Emporium can help meet OSHA requirements. We believe these 2 approaches do not conflict with existing MSDS information. You also asked the OSHA rules and regulations regarding use and access to MSDS information for both the stationary and mobile workforce. We would appreciate a brief written response to the items covered in this correspondence as to their acceptability by OSHA so that we may proceed with our discussions with the Bell South, Contel and U.S. Sprint organizations as well as other interested clients. This is in response to your letter addressed to Mr. H. Berrien Zettler, requesting a field directive which would allow a 24-hour toll-free telephone service to fulfill the material safety data sheet (MSDS) requirements of the Hazard Communication Standard (HCS), 29 CFR 1910.1200. The 24-hour telephone system does not satisfy the requirements of the rule for employees to have ready access to MSDSs when they are in their work areas during the workshift. Having MSDSs readily accessible means that the employee may read and refer to the information. This may be accomplished through actual paper copies of the MSDSs, or alternatively through computer terminal access or other means of providing readable copy on-site. A field directive allowing the use of this system in lieu of MSDSs cannot be issued, as this would not meet the intent of the present rule. Telephone access, where someone is available to interpret the MSDS information, could be used under the present rule to supplement the data sheets on-site. This could certainly increase the effectiveness of an employer's overall hazard communication program. Telephone access is also permitted under the mobile worksite provisions of the rule, where employees must travel between workplaces during a workshift. In this situation, employees have access to the MSDSs prior to leaving the primary workplace, and when they return, the telephone system is simply an emergency arrangement. I appreciate you and representatives of your organization meeting with members of my staff to discuss the merits and disadvantages of the system you propose. I hope the information provided above is helpful to you in implementing your system within the purview of the present standard. As you are `aware, rulemaking on the HCS is ongoing. A notice was published on August 8, 1988, in the Federal Register proposing modifications to the rule. The Agency is familiar with your submission of testimony to the record given during the public hearings held in December of last year. OSHA will continue to consider your suggestion as the Agency evaluates all the data and evidence submitted during the recent rulemaking. Mark the locations of your safety equipment and training materials with signs from Safety Emporium.